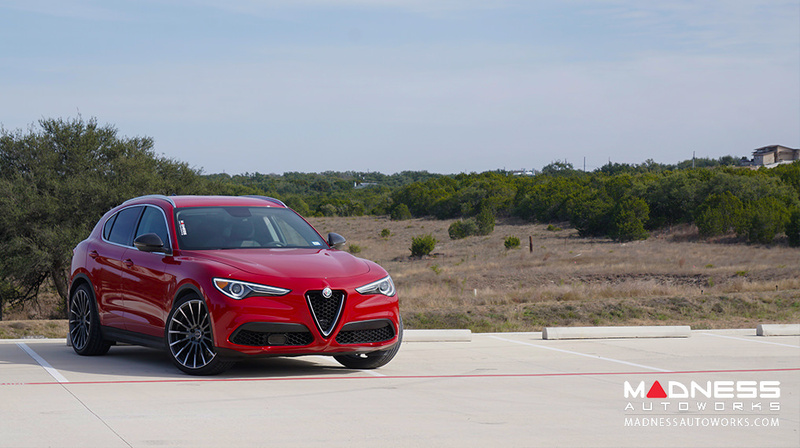 For those who lowered their Stelvio, did you notice any difference in your adaptive cruise control or front/rear sensors? Did you need to check for proper alignment after getting it lowered? I am thinking of installing a 1.2 inch lowering kit in my Stelvio. Marzio and Marco have provided some good input, any suggestions/input is much appreciated. One nice thing on our Stelvio, we have ground clearance to work with. All my cars are lowered... or at least the sport packs should be lowered... at least 10mm from the regular Stelvio. Like some others brands do. lost1750GTV, LC_LC, Flunx and 1 others like this. You should always get an alignment after changing anything in the suspension. That is a rule for any vehicle. 1.2" is a mild drop and should have little to no effect on the vehicle sensors. What the sensors are looking for is still there it is just the Z position of the sensor that as changed. Do you have any pics of a Stelvio lowered with those springs? Thanks for the info, I have no idea what the “Z” position is, but ok.
Vertical axis in three dimensional space. Conventionally labeled x for left/right, y for back/forward and z for up/down when looking at an object.